As a follow-up to the gluten-free experiment I did in November, I'm writing a series on my favorite gluten-free (GF) foods. Since I follow a gluten-free diet now, I have been continuing to explore different GF menu options. The first week, I wrote about breakfast and lunch, the next week discussed dinner at home, last week was all about eating out, and this final week, I'm writing about desserts and snack foods! Besides giving up bread during the experiment, another thing I was worried about were sweets. I try not to eat a lot of desserts, but sometimes I really get a craving for a cookie or something sweet after a meal. I mainly don't like feeling deprived when I change my diet. If the people I'm eating with are having a dessert, I don't always like to sit out because I can't have wheat. I particularly like chocolate chip cookies, so I during my experiment, I tried many different brands of GF chocolate chip cookies. One of my favorites (and my mom agrees) were the Pamela's brand chunky chocolate chip cookies, which are wheat- gluten- and dairy-free. They're not too crumbly, although they're not soft, and the GF flours they use don't have a strong flavor. I recently made the GF chocolate chip cookie mix from Bobs Redmill, and the cookies were a lot better than I thought they would be. If I make them again, I'll add more chocolate. Besides that, the texture of the cookies was good, and they turned out soft and tasty. I tried the Bob's Redmill GF brownie mix, and unfortunately, I have to recommend against it. I even made the brownies with the (optional) fudge topping, and they were still not very good. There was something really disconcerting about the viscosity of the brownie batter, and the taste wasn't what I would've expected based on all my experiences with other Bob's Redmill products. Oh well! Another favorite cookie of mine now is the Enjoy Life brand snickerdoodle (cinnamon cookie). They're chewy and have a great flavor. There's something about the cinnamon flavor that masks any other unusual flavor that some kinds of GF flour contribute. I didn't, however, like the chocolate chip or double chocolate cookie varieties from Enjoy Life. Enjoy Life also makes a good dairy-, nut-, soy-, and gluten-free chocolate bar that is quite tasty (I particularly like the crispy rice bar, which resembles a Crunch bar...something I don't eat because Nestlé is evil). In fact, most of the things I tried from Enjoy Life were at least pretty good. The brands that turned out to be terrible usually had one thing in common: the first ingredient was cornstarch. Ugh—nothing should be made of mostly cornstarch! If you're looking for a brand of GF cookie where you can buy any of the flavors and know it's going to be amazing, then buy WOW brand cookies. Overall, this was the best brand of cookie I tried, and I'm excited to try their other baked goods. My favorite of the WOW cookies so far is the peanut butter, but we tried chocolate chip, oatmeal, and snickerdoodle, too (yes, I bought lots of cookies for this experiment) and they're all very good. The texture is great, they're soft and chewy, and they don't taste "gluten-free" at all. WOW (WithOut Wheat) baking is "dedicated to creating the best tasting all-natural wheat and gluten-free baked goods found anywhere," and I think they've succeeded. Most ice creams are gluten-free. My favorite is a local brand Tilamook ice cream, the Caramel Butter Pecan flavor. Just take care when choosing an ice cream that it doesn't have bits of cookies (or graham cracker) or cake batter (also, brownies) in it. Chocolate chunks, nuts, caramel: all ok.
Around the holidays (or whenever you're feeling festive) Gluten-Free Pecan Pie is a great dessert to share. Gluten-Free Cherry Cobbler is perfect for Summertime entertaining. (And it can be modified for any fruit, perhaps an apple crisp in the Fall?) Nut Flour Cookies are good all the time! Another easy-to-make dessert food is marshmallow and rice cereal treats. They are one of my husband's favorite dessert foods, though we haven't made them recently. They're extremely simple to make—and you can even use your microwave if you're so inclined. Coconut macaroons are one of my favorite things to eat since I've been breastfeeding. Maybe they're technically a dessert, but they're also a fat, so I think of them as a snack. Jennies macaroons are my favorite kind, because they're not full of a bunch of artificial stuff, and they always taste great. I've tried the chocolate kind and those are good, too, but the original is my favorite. They're made of coconut, honey, and egg whites...that's it. So if you have lots of allergies, this is a great snack for you. Coconut has so much good-for-you fat in it, too! Ever since my sister visited after Daniel was born, I can't get enough sliced avocado and tomato with pepper and a little salt. It's a refreshing snack, has some great vitamins, and like coconut, avocado is full of good-for-you fats. Another fatty and protein-rich gluten-free snack is nuts. I eat all kinds of nuts, but some of my favorites are almonds, cashews, walnuts, and pecans. Most mixed nut flavorings don't contain gluten, but I always read the labels just in case! I don't usually buy flavored nuts, but because of this experiment I tried Yumnuts brand flavored nuts. They are gluten-free and also made with no added oils, so they don't leave your hands all oily after snacking. I definitely recommend this brand of nuts. Along the same lines, sunflower seeds or Roasted Squash Seeds make a nice snack when you want to have a little something salty. A lot of granola bars/cereal bars/protein bars have gluten in them, but I've found several that do not. Many Luna bars don't contain gluten, and all Kind brand fruit and nut bars are gluten-free. Kind is my new favorite "granola-type" bar. I haven't found one that I don't like, and they're very satisfying. I think my favorite flavor so far is the almond and coconut. Before I started eating totally gluten-free, I used to really enjoy making quick breads. So when I found this quick bread/muffin mix from The Cravings Place, I had to try it out. I made banana muffins, substituting a cup of homemade applesauce for some of the liquid and adding some vanilla extract. These muffins turned out so good. I served them to my dad when he was in town, and he didn't even know they were gluten-free until I told him. Like the Enjoy Life cookies, I think the flour in this mix lends itself well to flavors that mesh well with cinnamon, so next time I'm going to try apple muffins. Definitely try this mix if you can find it—it's totally worth indulging! If you've got a hankering for some gluten-free junk food, there are a few chips I can recommend. Baked Cheddar and Sour Cream Ruffles are gluten-free, as are Funyuns. Also, all of the Kettle Brand Potato Chips are gluten-free. It's so nice to know that any Kettle Brand bag that I pick up is safe, without having to check the label. Regular yellow, white, and blue tortilla chips and Fritos are made of corn, so I continue to enjoy chips and salsa, as well as chips and Roasted Garlic Hummus, which is also delicious on raw vegetables. Spinach Artichoke Dip is also good on tortilla chips, and is a fun dish to serve, particularly when you're having company. Speaking of company, if you want to impress someone with how good gluten-free food can taste, start out with a Stuffed Mushrooms appetizer. Those taste so delicious, your guests won't be missing the bread at all! I hope you enjoyed this series on my favorite gluten-free foods. It's been really fun to write and go back through all these things I've made in the past months with this new dietary modification. You really can eat delicious foods without eating wheat (even pie!) and not ever feel deprived. What are some of your favorites? I can't wait to hear! Linked up at Friday Food at Momtrends, Food on Fridays at Ann Kroeker, Friday Favorites at Simply Sweet Home, Fight Back Friday at Food Renegade, Tuesdays at the Table at All the Small Stuff, Slightly Indulgent Tuesday at Simply Sugar and Gluten-Free and Food and Health Carnival at Lisa's Gluten-Free Advice and Healthy Living. I don't follow a gluten free diet but I know a number of people who do so I will 'tweet' your post! 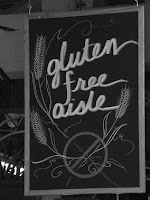 I found it very interesting to read about the gluten free brands out there. I know that many of the brands of cookies I buy when I am not baking my own are actually gluten free, but I buy them because I like the taste! You've done a heckuva lot of research, trying and erring, and recording of the results! Awesome, Amy. I'm sending your blog link to a friend of mine who has some serious health issues and is always experimenting with GF eating. Yay for Jennies Macaroons! The "Macaroon King of Brooklyn"—the fellow in the tux on the side of the container—is the father of a good friend of mine. Yum, yum, yum. @Rachael: You know Arnold Jennie? That is so interesting! Those macaroons really are the best. I love WOW cookies. I had them the first time I reintroduced dairy and I really wish I could have them again! I really like RiceWorks rice chips. They had them at Costco for a bit and I'm hooked. As far as sweets, we usually bake everything at home (since I'm dairy- and soy-free too), but I really like the French Meadows chocolate chip cookies. Yum! What a great list. I'll have to look around at your other GF posts. Greetings from Scotland! I enjoyed reading your articles. I've been looking for such products and I'm happy to see them here. Thanks!